For Bruce Morlan and Veda Kanitz, Tuesday's caucuses will be less about the candidates and more about rallying support for a solution to climate change. That's especially true for Morlan, a Republican from the Northfield area who doesn't have a GOP candidate who agrees with him on climate change. "We've seen the extraordinary proof," Morlan said of the issue. "It's smart to take action on it." That's in stark contrast to GOP front-runner Donald Trump, who has suggested climate change is a scam. Texas Sen. Ted Cruz has dismissed the science of climate change. Florida Sen. Marco Rubio has been more cautious in recent months with his comments on climate change but usually answers questions about it by saying he refuses to "destroy" the economy by addressing it. Both Democrats running for president, Vermont Sen. Bernie Sanders and former Secretary of State Hillary Clinton, support action on climate change. 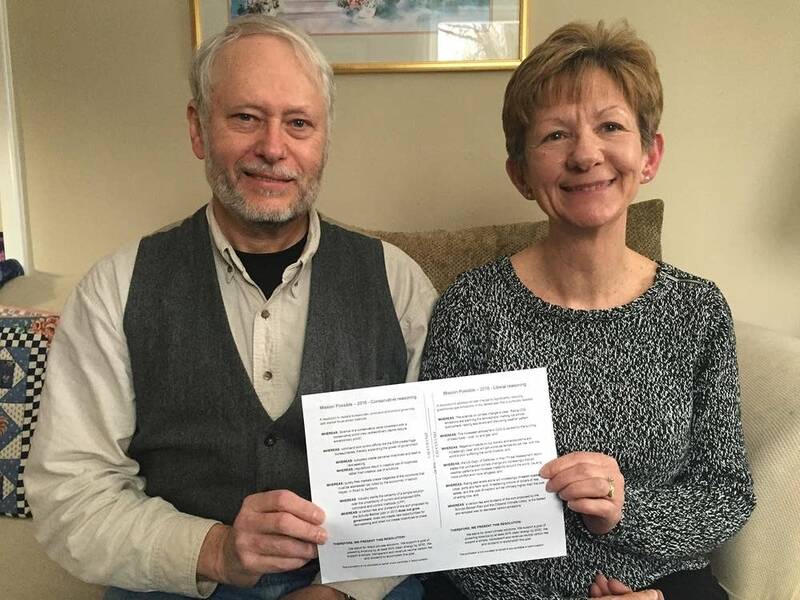 Morlan and Kanitz, who lives in Lakeville and is chair of the DFL Environmental Caucus, teamed up to propose climate change resolutions at their caucuses on Tuesday. Unlike a primary where voters only cast ballots for their proposed candidates, caucuses offer an opportunity for citizens to influence their political parties' positions. Morlan, a retired statistician with a 20-year military career, knows his odds of doing that aren't good. But over the past year or so, he's been practicing his arguments in favor of climate change action one-on-one with other Republicans. "I talk tactical. If we don't do something about it, we're going to spend the next 20 election cycles doing Democratic things about it," he said. "Because they're going to do things about it, and they're going to get the people to back them because the people are afraid of this." The resolutions he and Kanitz are proposing reach the same conclusion: that at least half of the country's energy should come from renewable sources by 2030 and that a fee on carbon emissions that is distributed back to taxpayers is the solution. "Talking to Bruce, I've learned that we're not polar opposites on every issue," said Kanitz, who has been involved in DFL politics since she moved to the state in 1982. Both traveled to Washington, D.C., last summer as part of Citizens' Climate Lobby, a nonpartisan group that's pushing a carbon fee and dividend to reduce carbon emissions. She said not all Democrats support the idea, but she said working with Republicans is essential. "We're not going to solve this alone. This is not a DFL or a GOP thing, it's everybody's problem and we must solve this problem for future generations," she said. Kanitz and Morlan are encouraging others to reach out across party lines on the need for a carbon fee. Then they're asking people to attend the caucuses and submit resolutions on the issue. For Republicans, the reasoning leading up to the carbon fee recommendation talks about free markets and criticizes subsidies and regulations. The DFL version talks about climate change impacts like sea level rise and harming ecosystems. "We're all in our echo chambers making echo chamber music and we need to get out of echo chamber music-mode and create a symphony of music that will solve this problem," said Morlan, who is also seeking to challenge state Sen. Kevin Dahle, DFL-Northfield, this fall. Fellow Republican John Howard agrees that addressing climate change is important, and he says caucuses are the perfect opportunity to try to move others in the GOP on the issue. "It's the main time when people in the Republican Party get together," he said. Howard, a student at the University of Minnesota's Humphrey School who lives in Edina, tried in 2012 to pass a resolution that would have stripped the state GOP platform of language denying that climate change is human-caused. He failed, but in 2014 others in his precinct were successful and the measure passed the Senate district level, too. "That made me optimistic that it might change," he said. "I put the perspective forward that the longer we wait to not do anything, the more intrusive the action will have to be." While Howard and Morlan feel like they're a rare breed in the Republican Party, poll numbers show they probably aren't. St. Cloud State University researchers asked Minnesotans in a scientific phone survey about their views on climate change in both 2014 and 2015. The results were consistent year to year, showing nearly 90 percent of Minnesotans believe climate change is happening now and more than three-quarters believe it's important to prepare for the effects of climate change. St. Cloud State sociology professor Ann Finan says the rhetoric from candidates like Trump and Cruz doesn't reflect what Republicans are telling pollsters about climate change. Her team's survey shows well over half of Minnesota Republicans say it's an important issue for the state. She says national polls also show acceptance of human-induced climate change. "The general public is moving toward belief in climate change whereas several of the Republican candidates do not believe in climate change and/or don't believe that it's human caused," she said. Yet national polls also show climate change is not a top issue for most voters. Whether it takes on a bigger role in the general election this fall remains to be seen, but Finan said after the primaries, candidates usually change their messages to appeal to voters in the middle. For the GOP nominee, "that message (about climate change) may well have to change," she said.